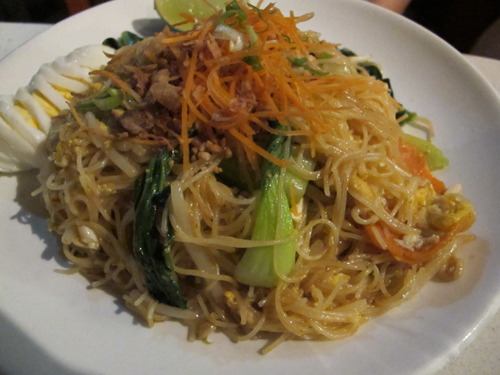 There’s nothing I didn’t love about the food we had at Noodle Bar down in Greenwich Village. Their Pan-Asian food is a healthy mix of Thai, Indian, and Korean-inspired (at least by my count). 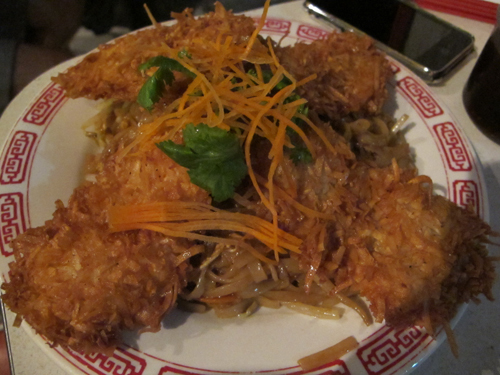 I ordered their Coconut Shrimp dish with spicy flat noodles. What I loved about this dish was the jumbo shrimp was covered by a thick fried coconut shell where you can really taste the flavor. The flat noodles were delicious too, not overly-doused in oil. My friend Marie got this veggie dish which was equally and unassumingly tasty. She also ordered a mango lassi, which FYI, is doesn’t taste much like real Indian mango lassi (which is a lot thicker and heavy). But I’m not a huge lassi fan anyway so this was good thing to me. The drink really just a standard delicious mango smoothie. The place is not expensive either, perfect for just a simple laidback dinner with friends. Just remember to bring cash. They don’t accept credit cards! And just a PS, they also have a LES location down on Orchard Street.